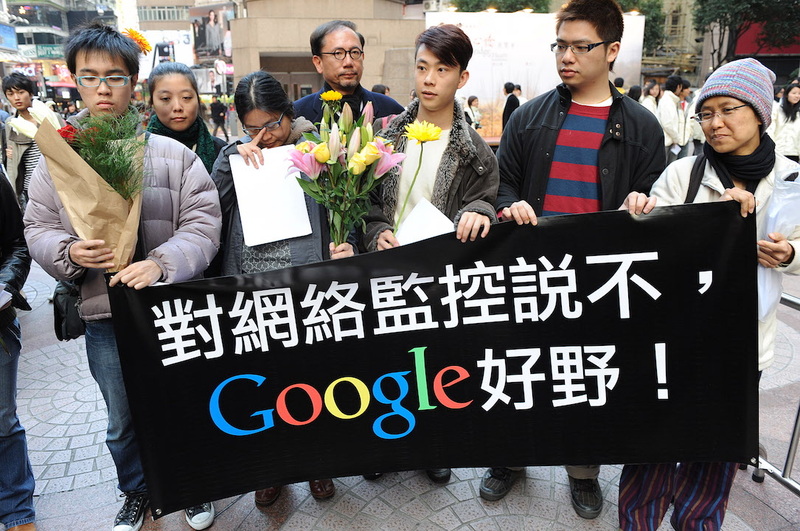 A banner reading ‘Say no to Internet censorship—Google, well done!’ paraded in Hong Kong in January 2010, right before the American company pulled out of China to protest censorship of its Internet search results. The idea that Chinese Internet controls harm foreign companies operating in China is not new. In 2016, an annual survey by the American Chamber of Commerce in China found that 79 percent of U.S. companies in China say they have been negatively affected by online restrictions; surveys from previous years yielded similar results. Internet blocks have proven costly to U.S. companies already operating in China—The New York Times lost an estimated $3 million in the year after its website was blocked in China in 2012—and serve as a significant deterrent to foreign companies considering investing in operations there. Yet the National Trade Estimate report from the United States Trade Representative (USTR) is the biggest move that the U.S. government has taken towards recognizing that Chinese Internet censorship may constitute trade barriers that violate World Trade Organization (WTO) regulations. But while it’s an interesting development, the report has no teeth. Only three sentences in the report address China’s Internet restrictions, essentially labeling them a nuisance but doing little to lay the foundation for any future related case to be submitted to the WTO. International Internet law and governance is still in the early stages of development. While the United States has championed an open and free Internet based on principles of free expression and universal values, China has framed Internet regulations as issues of national sovereignty and national security, arguing that each country has the right to determine what should or should not be allowed to pass its virtual Internet borders. The United States has worked to promote its vision for the Internet by incorporating its emphasis on free flow of information into several major free trade initiatives. The U.S.-Korea Free Trade Agreement in 2011, for example, was the first to raise the issue of cross-border data transfers. The Trans-Pacific Partnership and the Transatlantic Trade and Investment Partnership, two sweeping trade agreements which would, if approved and enacted, aim to guide trade practices for the 21st century, also include provisions which discourage or prohibit restrictions on cross-border data transfers. If, in the long term, USTR were to take further steps towards building a case that Chinese Internet restrictions constitute a trade barrier, and eventually file a WTO case against China challenging the restrictions, this could further bolster the U.S.—though even if the WTO ruled in favor of the United States, Chinese compliance seems extremely unlikely. But such a move could also have unforeseen consequences, depending on the specific language used to craft such a ruling or agreement. Currently, the legal line dividing acceptable from unacceptable Internet censorship in the realm of international standards is fuzzy. A ruling from the WTO, or some other type of multilateral agreement establishing international standard practices, would help define that line. And while that would provide protection for companies harmed by Internet restrictions deemed unacceptable, it could legitimize censorship that goes right up to that line without crossing it, thus granting official legal status to some censorship. From the perspective of those who wish to see the Internet remain a free and open international space, this would be at best a compromise. The U.S. Trade Representative’s labeling of the Great Firewall that the Chinese Communist Party has built between the Chinese Internet and the global Internet as a barrier to international trade is good move by the Obama administration. Foreign governments have frustratingly few tools with which to influence domestic human rights practices in China. Our public statements criticizing the worsening repression of civil society and the mass media have little affect. When China bans Western newspapers or denies visas to journalists and scholars whose views it dislikes, we are reluctant to retaliate against Chinese journalists and scholars because we don’t want to further impede the free flow of information to Chinese people. My own experience working in the State Department from 1997-2000 taught me that American efforts to induce improvement in human rights by shaming China in international forums such as the U.N. Human Rights Commission, or linking human rights to other issues in the U.S.-China bilateral relationship, don’t succeed. Calling the Great Firewall a trade barrier also has the benefit of being patently true. The barrier restricts market access for foreign media organizations and Internet companies. And it produces what U.C. San Diego China Internet scholar Molly Roberts calls “friction” in international communication and information that raises the cost of doing business in China for all firms, Chinese as well as international ones. Jumping over The Wall requires a Virtual Private Network (VPN). The Chinese authorities continually are harassing the VPNs and periodically shut them down entirely. As a result, searches for information and communications with an office overseas are exasperatingly slow and plagued by interruptions. China-based companies also are unable to take advantage of platforms for collaboration such as Google+ that have led to major improvements in efficiency for companies outside of China. The Global Times’ argument is that the Firewall is a form of protection needed until the time that “China and the West share an equal footing in terms of soft power.” For now, China needs to protect itself from the Western values embedded in the global Internet to give it “time to empower ourselves with soft power and strength.” But like other forms of protectionism, import substitution informatization will weaken a country’s power rather than strengthen it. It is notable that the Office of the United States Trade Representative has described China’s Internet censorship as a trade barrier. China, however, is clearly not in the mood to heed Washington’s concerns about Internet freedom. Nor is it a secret that Internet censorship hurts foreign businesses. Beijing might be more persuaded by the case for how Internet censorship affects Chinese businesses. China continues to defend its style of Internet governance, as well as the Great Firewall’s ability to protect China from “harmful content” from overseas. China’s Cyberspace Administration has already responded to USTR, saying that censorship does not violate trade commitments. “The aim of the internet security inspection system is to guarantee the security and controlability of information technology products and services, safeguard user information security, and strengthen market and user confidence," CAC told Reuters. "China scrupulously abides by World Trade Organization principles and its accession protocols, protects foreign enterprises' lawful interests according to law, and creates a fair market environment for them.” Chinese authorities would likely be more receptive to evidence of the economic costs of censorship. Sure, some will argue that blocking Web sites can actually protect Chinese start-ups from foreign competition. But barriers to online information can have a negative impact on Chinese companies as well. A 2014 New York Times article, for example, described how Google’s troubles in China were not only creating problems for the US company. “Chinese exporters have struggled to place Google ads that appeal to overseas buyers. Biotechnology researchers in Beijing had trouble recalibrating a costly microscope this summer because they could not locate the online instructions to do so,” the article said. A few years earlier, Baidu CEO Robin Li remarked on the costs of domestic self-censorship, suggesting that such costs gave Google a competitive advantage. “We have to spend a lot of resources to make sure our content and services abide by Chinese law, and they don’t,” Li said. China is currently in the midst of a start-up fever. It would be useful to illustrate how a less restricted Internet would bring China closer to its goal of becoming a center of innovation. This is really two questions. One is whether China's Internet censorship policies are impeding trade and discriminating against foreign companies. The answer, according to the other contributors to this discussion, seems to be yes. The second question is whether China is violating trade rules and whether the United States, or anyone else, can do anything about it. The simplest way to find out would be to challenge the Chinese measures in the World Trade Organization disputes procedures. A successful challenge would need to demonstrate, to the satisfaction of a disputes panel and the Appellate Body, that China’s actions are in breach of its commitments under the General Agreement on Trade in Services (GATS) and/or of other articles of the WTO treaties. If such a challenge succeeded, China would have to comply with it or face authorized trade retaliation up to an amount to be set by an independent assessment body. However, the fact that U.S.T.R. has not spelled all this out suggests that it may be unsure that it has a strong case in law. If it does not, then there is little else it can do, since to retaliate unilaterally against China without WTO authorization would risk precipitating a disputes challenge by China, which it would almost certainly win. A third option, of course, would be for the U.S. and other interested countries to seek to negotiate with China new and stronger rules governing Internet restrictions. That course seems unlikely to yield much in the way of results, however.